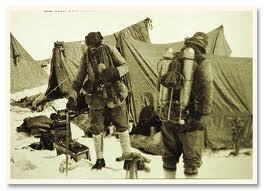 Kin Bentley In Line: Did George Mallory conquer Everest? Was George Mallory the first man to summit Mount Everest? 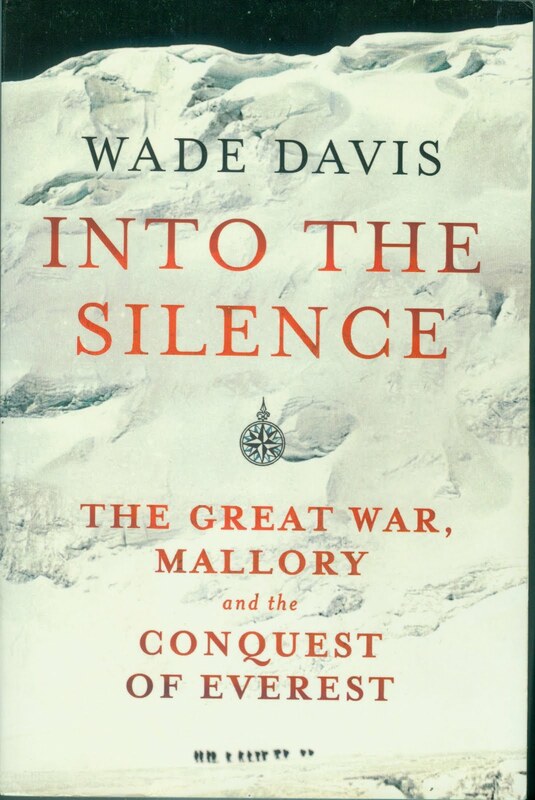 This is the key question which Wade Davis attempts to answer in his book, Into The Silence: The Great War, Mallory and the Conquest of Everest (The Bodley Head, London). My review of this book was published in the Weekend Post, Port Elizabeth, on April 7, 2012. This is the uncut version. The cover of the book, Into the Silence. The 1924 Everest expedition party is dwarfed by the North Col, to which they are heading. Bentley Beetham took the picture. THE best place to start discussing a book of such a vast scale of scholarship is not at the beginning, but at the end, with the epilogue. For it is here that the Canadian author deals with the key question which has fascinated the world ever since George Mallory and Sandy Irvine failed to return from a last-ditch attempt to summit the highest mountain in the world on June 9, 1924: did they reach the top? 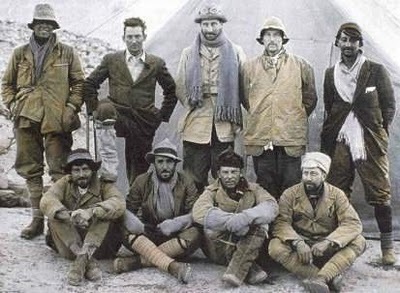 Sandy Irvine (back left) and next to him George Mallory, with other members of the 1924 expedition, photographed by John Noel and later colour-tinted. To get to this point, however, one must first accompany the author – through over 550 pages – on a series of journeys of such heroic proportions it is almost impossible for someone in the 21st century to fathom how people could have endured such hardship and survived. This was a time when to be British and an adventurer meant you inevitably became part of the Great Game, the running of the largest empire the world had ever known, which embraced about a quarter of the world’s land mass and population (about 500 million people). And a large percentage of those people lived in India, where the Britons’ meticulous mapping of the terrain had led to the discovery in the 1850s of the highest peak in the world. This book sticks with imperial measures, and the mountain, named after the surveyor general of India, Sir George Everest, stood at just over 29 000 feet. Interestingly, it was pronounced Eave-rest, not Ever-rest. And by the late nineteenth century, the clamour to be the first nation to conquer it grew apace. The problem was that the British Raj in India was not on good terms with the Nepalese government, so an assault from the south was ruled out. Thanks to the work of old “Asia hands”, the government under the 13th Dalai Lama in Tibet was less antagonistic, so it was decided to tackle the mountain from the north – from the highest plateau in the world, where even before you start to climb mountains you experience altitudes and temperatures guaranteed to induce illness in those who have not spent a lifetime acclimatising to the conditions. 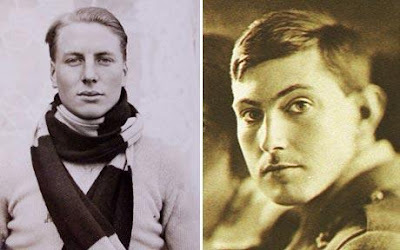 George Mallory (right) and Sandy Irvine, who died in 1924 while trying to become the first people to climb Mount Everest. Davis could simply have written a book about attempting to climb Everest. Indeed, much of this saga deals with the 1921 expedition where a major survey was done of Everest and its surrounds, as the explorers sought a way onto the mountain. This, the North Col, was only found after months of trekking across arid plains, along crevasse-riddled glaciers, through knee-deep snow and up ice-covered cliffs while scaling peaks way higher than anything in Europe. 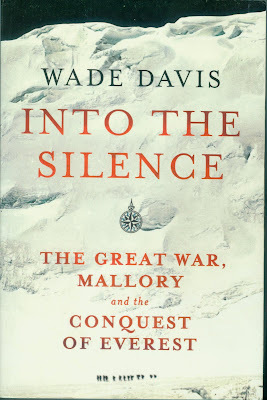 But with this and the subsequent attempts in 1922 and 1924 – Mallory was the only man to participate in all three – Davis also explores the personalities involved, and especially how the horrors which so many endured during World War 1 affected them psychologically. It is a fascinating premise because in his exhaustive research, conducted over 10 years, Davis was able to delve into the very heart of a conflict which, when seen in retrospect, was clearly the height of madness. Never before had governments sent out their young men in such numbers to face such atrocious odds of coming back alive. 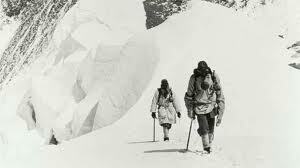 Most of the men, having somehow survived the war, who made it onto the Everest expeditions were either still in the military (many based in India), or were medical doctors who had seen the horrific effects of shells, bullets and mustard gas on human flesh. Many, like Mallory, were highly educated graduates. Indeed, while at Cambridge Mallory counted among his friends and acquaintances the likes of Rupert Brooke, EM Forster, Bertrand Russell, Maynard Keynes, Aldous Huxley and Virginia Woolf. At university, one of the key pastimes during annual summer vacations for energetic young men was to spend the time climbing in the Alps. It was there that Mallory established a reputation as the greatest rock and ice climber of his age. He was the obvious choice to lead the climbing party. However, in this era before modern communications and transport, the biggest stumbling block for such expeditions was logistics. The trek parties would each have to set off – hundreds of heavily laden yaks, ponies and porters – from Darjeeling in northern India, and cover hundreds of miles of inhospitable terrain before arriving at the foothills of the Himalayas. Only then, with the rudimentary climbing apparatus available to them, could they set about establishing the various camps up the East Rongbuk glacier. This is the story of just how arduous that task was, as porters collapsed under massive loads; as in mid-summer their bodies experienced heat in the high 30s centigrade, while their feet (shod in leather boots, a far cry from modern nylon-based boots) suffered frostbite. Geoffrey Bruce and George Finch, photographed returning to Cape IV by John Noel in 1922, after climbing to a then record of 23 000 feet. Davis unpacks a wealth of information, all of which adds to the poignancy of the story. How, for instance, the Everest Committee in London rejected an Australian expert on the new-fangled concept of using oxygen tanks for the 1924 expedition because he had rubbed them up the wrong way. And how Sandy Irvine, aged just 21, stepped in to fill this gap, and as a result ended up that fateful day accompanying Mallory on what was the last of several attempts to conquer the mountain that year, as the impending monsoon threatened. Indeed, it was the weather – totally unpredictable at those altitudes - more than anything else, which scuppered those many early attempts. The last picture of George Mallory (left) and Sandy Irvine, taken by Noel Odell at Camp IV on the North Col of Mount Everest on June 6, 1924. So, with eight lives already lost (seven of them porters swept away in a 1922 avalanche), everything boiled down to whether Mallory, 36, and Irvine managed to scale a 100 foot cliff face, the Second Step, which would have left them with a relatively short final spurt up the last pyramid and onto the top of the world. One of the climbers, who was at the support camp just below them, swore later he saw them, through the mist, having conquered the Second Step and surging for the summit. In the epilogue, Davis fast forwards to 1999, when top US climber Conrad Anker leads an expedition to try to find Mallory’s body. Miraculously, he finds it, mummified but partially exposed above the ice, name tag still visible on his collar, three letters in his pockets. Anker then attempts to climb the Second Step in a bid to ascertain whether it was possible. He cannot do it without the sort of assistance not available to Mallory at the time. But does this prove Mallory didn’t make it? Davis, of course, is unable to say one way or the other, but he does note that, having survived the horrors of the trenches and being driven as no man before him, it was indeed possible Mallory did indeed summit Everest 29 years before Edmund Hillary and the Sherpa, Tenzing Norgay. Exhaustively researched (the annotated bibliography runs to over 40 pages of small type), this book is an intellectual accomplishment on a par with the physical achievements of Mallory and his comrades nearly 90 years ago, before any aerial photographs had even been taken of Everest and its surrounding peaks. Indeed, one of the great advances made during these adventures was in the development of photography, both stills and movies, which set a benchmark for an industry which would become so powerful and influential down the century. Read this book and marvel at what individuals with drive, guts and determination are capable of achieving, even those mentally and physically scarred by the most terrifying of conflicts.